Yesterday, I downloaded the book ‘Writestorm’ by Andy Mengel and I read it cover to cover in one sitting. I was so inspired. Andy’s experiences with writing his early books were exactly the same way I wrote The Phoenix Project. It took me ten years and I would write huge amounts one day, then literally leave it for five or six months, doing nothing at all. My next book, A Chronicle of Chaos, only took 3 years, and my latest – The Shield of Soren, 1.5 years. So it’s getting better. But since Andy introduced the concept of Writestorm into our group, my whole writing ethic has been completely transformed. In two months I have written 30,000+ words – all entirely through Writestorm sessions. Something he talks about in the book really resonated with me. I want to be a doer now, not just a dreamer. I’m ready to stop this being a little hobby and make it into a proper career now. 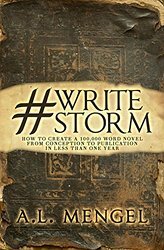 If you haven’t read Writestorm yet – do it. NOW. I promise it will revolutionise the way you look at writing a novel. My wonderful Facebook community, The #Awethors, has adopted Writestorm whole-heartedly and we are now holding Writestorm Saturdays every first Saturday of the month, where authors from across the globe can drop in one various sessions throughout the day. Why not join us? Do you think this would be a worthwhile read for someone like me? I’m not writing a novel but I am a full-time blogger. I’m in the fortunate position right now where I have lots of time to write but I’m always on the lookout for ways to increase my efficiency and productivity.